Fiction: Big Wave land is zoned for agriculture and open space. Fact: Big Wave land is on two urban, infill parcels zoned for development that are between two existing large commercial and residential developments. Fiction: Big Wave does not comply with the General Plan, Local Coastal Plan and zoning regulations. Fact: The 5,000-page EIR, the 300-page county staff report and the San Mateo County Planning Commission judged Big Wave compliant with all building regulations spelled out in the General Plan, Local Coastal plan, and related government codes. The County Board of Supervisors unanimously approved Big Wave after a thorough legal and environmental analysis. Fiction: The project will result in loss of scenic views and impacts environmentally sensitive habitats. Fact: Big Wave is not in a view corridor. The project, according to a visual EIR analysis, will be completely shielded from view with the planting of over 8,000 trees. Building the project is the environmentally superior alternative to not building it. The LEED Platinum design of Big Wave improves the water-starved Pillar Point Marsh with over eight acres of restored wetlands and 100% water recycling. Fiction: Big Wave will be built on protected wetlands. Fact: According to the final EIR, which included a certification from The Army Corps of Engineers and several biological consultants, Big Wave provides at least the required 100’ buffer from all wetlands. Fiction: The Big Wave project needs more environmental studies. Fact: Big Wave went through a seven year County directed Environmental Impact Report (EIR) that cost the land owners $1.4 million for the EIR report and associated design, economic, engineering and biological studies. The final EIR is over 5,000 pages long. Over 50 independent consultants analyzed over one thousand environmental issues. The final EIR concluded that the project has no substantial environmental impacts. Fiction: The business park is too large for the Coastside. Fact: The business park is designed to be built in phases based on the demands of local businesses. Presently there are no places for growing local businesses to expand on the Coastside and historically local businesses have had to leave the area to grow. According to EIR demographic studies, the lack of local employment has created a frustrating, environmentally damaging situation in which 85%, over 3,000 Coastside professionals, commute over 40 miles each day for work. The business park will greatly improve the imbalance of jobs to residents on the Coastside. Fiction: Big Wave will create too much traffic. Fact: Four EIR traffic studies at a cost of $68,000 concluded Big Wave’s impacts to local traffic are less than significant and that Big Wave improves regional traffic access to the coast. The project will reduce traffic congestion (through reverse commutes its local hiring will create) on Highway 1 and Route 92. Fiction: The residences of the Wellness Center are in extreme danger from a tsunami. Fact: An expert tsunami report in the EIR concluded the Wellness Center is not within the Tsunami Hazard zone and the first floor is eight feet above the worst predicted tsunami that will occur in 500 years. Fiction: The Wellness Center residents will be isolated. Fact: The Wellness Center residents, adults with developmental disabilities, will be less isolated. They will have access to employment, a thriving commercial center, recreational and educational facilities that presently do not exist, and be part of an interactive community geared to their special needs. The Wellness Center is on two bus lines and it will have onsite shuttle services. The community is 1.5 miles from a hospital, next to the Princeton commercial activities, and within walking and wheelchair distance of the harbor and beaches. The interdependent design of the Wellness Center and the adjacent business park will provide incalculable interactive opportunity for those with developmental disabilities, residents and non-residents alike. Fiction: Zoning for The Wellness Center land does not allow for residential development. Fact: The EIR concluded the Wellness Center property is properly zoned for its proposed purpose. The elected San Mateo County Board of Supervisors, who have the legal authorization to determine compliance with their zoning and subdivision ordinances, has determined the Wellness Center meets all zoning requirements. Fiction: The Wellness Center is a ruse to create condominiums for wealthy people. Fact: The owners of the property have donated the 5.25 acre Wellness Center land to Big Wave Group, a 501 C 3 public benefit non-profit. The non-profit is chartered to provide services and create benefits for those with developmental disabilities. It would be illegal and impossible for the non-profit to convert assets intended to create benefit to the developmentally disabled into a for-profit scheme to sell condominiums to wealthy people. In addition, the EIR and the subsequent approval from the San Mateo County Board of Supervisors are based on a specific project that cannot be changed. 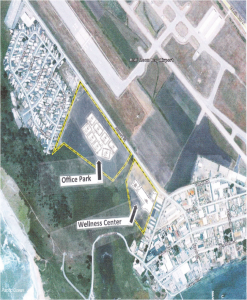 Fiction: The Wellness Center is not a compatible land use with the airport. Fact: The EIR and the County Board of Supervisors concluded the Wellness Center is a compatible land use with the airport. Fiction: People with developmental disabilities are not permitted to live at the Wellness Center site because of various ordinances. Fact: There are no legal ordinances that prevent those with disabilities to live in areas where those without disabilities are permitted to live. Any such discrimination against the disabled is illegal under local, state and federal law. The EIR and the County Board of Supervisors confirmed this fact.